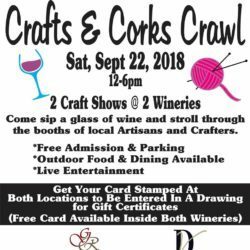 Join Grand River Cellars and Debonne for a craft crawl. Both wineries will feature a large selection of juried crafters from noon-7:00pm outside on the lawns. It will be a great afternoon of shopping, sipping and relaxing. Music plays from 3:30-7:30pm. Visit both wineries and receive a stamped ticket to be entered into a drawing for a $50 gift basket.